The importance of big data is soaring. Each day, the profound impact of data analytics can be felt across myriad domains of digital services – courtesy an endless stream of information they generate. Yet, a handful number of people actually ponders over how big data is influencing society’s some of the most important professions, including legal. 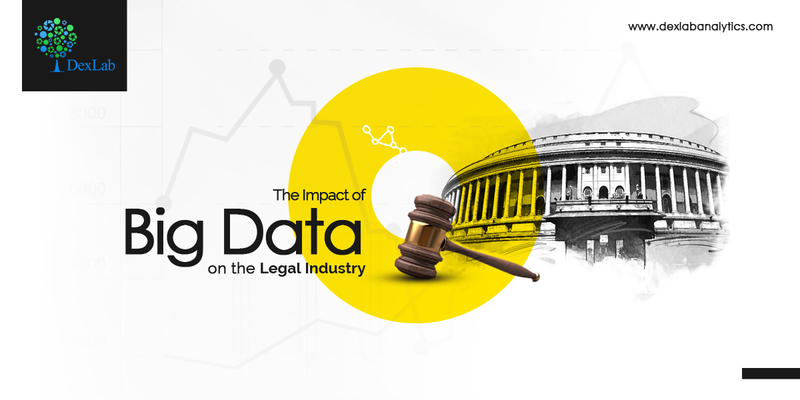 In this blog, we are going to dig into how big data is impacting the legal profession and transforming the dreary judiciary landscape across the globe. Information is challenging our legal frameworks. Though technology has transformed lives 360-degree, most of the country’s bigwigs and institutions are still clueless about how to harness the power of big data technology and reap significant benefits. The men in power remain baffled about the role of data. The information age is frantic and the recent court cases highlight that the Supreme Court is facing a tough time taming the big data. However, on a positive note, they have identified the reason of slowdown and are joining the bandwagon to upgrade their digital skills and upend tech modernization strategies. Data analytics is a growing area of relevance and it must be leveraged by the nation’s biggest legal authorities and departments. From tracking employee behaviors to scanning through case histories, big data is being employed everywhere. In fact, criminal defense lawyers are of the opinion that big data is altering their courtroom approaches, which have always dominated the trials with a set of certain evidence. Today, the pieces of evidences have become digital than judicial. The technology of big data has proved to be a welcoming-change for the army of law enforcement officials; the reason being efficiency in prosecuting a large number of criminals in a jiffy. Officials can now scan through piles and piles of data at a super-fast pace and handpick scam artists, hackers and delinquents. Besides law enforcers, police officers are also identifying threats and rounding up criminals before they even plan to get way. Moreover, the prosecutors are leveraging droves of data to summon up evidence to support their legal arguments in court. That’s helping them win cases! For example, of late, federal prosecutors served a warrant to Microsoft to gain access to their data pool. It was essential for their case. Biggest of all, big data is transforming the intricacies of the legal profession by altering the ways how scholars research and analyze the court proceedings. For example, big data is used to study the Supreme Court’s arguments and we have discovered that arguments are becoming more and more peculiar in their own ways. Such research tactics will largely lead the show as big data technology tends to become cheaper and more widely popular across the market. In the near future, big data is going to be applied in a plethora of industry verticals and we are quite excited to witness impactful results. As a matter of fact, you don’t have to wait long to see how big data changes the legal landscape. In this flourishing age of round-the-clock information exchange, the change will take no time.